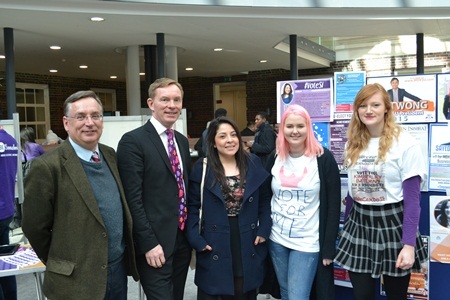 Politics was put in the spotlight this week as students from Middlesex University were given the chance to quiz Shadow Minister for the Arts Chris Bryant during a campus visit on Monday 2 March. Joining the MP for Rhondda, South Wales, at the University was Hendon Labour candidate Andrew Dismore, who both took part in a roundtable question and answer session. In a lively debate, students grilled the politicians on topics ranging from housing to wages, benefits to the health service and employment prospects for the younger generation. The politicians then met with candidates running for this year's Student Union elections before heading back to Westminster. Ed Marsh, Director of the Students' Union, said: "Politics is high on the agenda this week, as polling opened for this year's student elections. They really took the opportunity to bring to the table topics that are close to their heart, putting their debating skills to practice. "Hearing from politicians who are campaigning in the run up to this year's general election was really inspiring for our candidates and we hope it will make for an exciting week ahead of campaigning across the campus."